Francis Kéré is a Burkina Faso-born, Berlin-based architect known for his adaptive use of vernacular materials in structures like schools and other gathering places, especially in his native land. 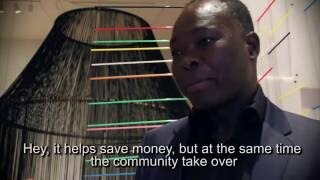 The Artblog video shows Kéré’s passion for community participation in his projects. Artblog spoke with the architect on May 13, 2016, at the Philadelphia Museum of Art’s Perelman Building, home of five Creative Africa exhibitions. You can see Kéré’s immersive architecture at the PMA Perelman building now until Sept. 25, 2016. More about Creative Africa here and more about Francis Kéré here. Thank you to our Art Splash/Creative Africa team of Jennifer Zarro, Project Manager, Eli Laban, videographer and video editor, and Arielle Alterwaite, video and photo assistant, all of whom did a great job of capturing the people, action, words, and art. Eli wrangled the many hours of film footage into 4 beautiful and compelling narratives. Look for the next video, focusing on Nigeria-Berlin-based photographer, Akinbode Akinbiyi, coming up soon!